How did you transition from a performer to a psychic medium? I have always been both. I just kept them very separate for years and years! I wasn’t sure the world was ready for an actor who also saw the future and talked to dead people. Especially once I started my production company Brain Brew Entertainment where I produced very corporate industrial shows. So, I kept the “magical” part of me very private. Then, in about 2008 – when the last economic crisis hit – and “corporate entertainment” became a dirty word AND reality TV was taking a huge hold, somebody who knew me asked me to do a séance on a CMT show called “Mobile Home Disaster”. I figured no one probably watched that show – so why not – plus, my income from performing was way down due to my live shows practically tanking with the economy! I remember the day after it aired – one of my very corporate clients called me and I was sure it was the end of that relationship – but quite the opposite was true. She said, “I didn’t know you were into the paranormal, I LOVE the paranormal!” – and immediately our relationship became stronger than ever! Due to my years of TV experience and my psychic abilities the Reality stuff just kept coming in fast and furious – and I found it more fun and more fulfilling than just performing or producing! I loved getting to be “myself” on a show and giving little bits of insight and wisdom to an audience I would NEVER have acting or in my one-on-one psychic work! When did you first learn you had psychic abilities? As far back as I can remember, I knew I was different. When I was just a toddler, I knew that the “imaginary friends” little kids have were not all imaginary! I knew that they were real entities and beings that I could talk to, play with and get to know. I also knew that I was just not “overly sensitive” as my mom put it, when I would come home from school and tell her about what the other kids were thinking and saying.This was usually just chalked up to my vivid imagination. I knew there was more to it though. I became a seeker… even at a young age. I traveled. Without leaving my room, I traveled near and far to see what was out there. I remember one time going with my mom to one of her friend’s homes for a luncheon. I swore up and down that I had been there before.My mother assured me that I had not, that neither of us had been there before. Then I proceeded to tell her the color of every room within the house – right down to the pattern of the wallpaper in the bathroom – before we even entered the front door. My obsession with “the beyond” grew and grew. I decided I needed to consciously contact a dead person. I was seven or eight years old. Unfortunately, I didn’t really know any dead people, so I decided on Marilyn Monroe and John F. Kennedy. The two most famous deceased people I had heard of. I knew most of my “usual” contact with the other side was at night in the dark, so since it was daytime I went into our windowless hallway, closed all the doors, lined the cracks with towels and dragged my best friend Sherry Jones in with me. We sat cross legged on the floor and I started asking the spirits of Marilyn and John to enter the room. I asked, I pleaded, I believe I even created my first chant – and low and behold – the hallway filled with orbs of bright light. They started in the corner and quickly began filling the room. It was amazing. Sherry and I, being proper little girls, ran screaming out of the house… but I had never been so excited. I had actually and consciously contacted the other side. My journey had begun. In talking a bit more to my mom, I began to learn a little more about my family history – how her grandmother was clairvoyant and always knew when someone was going to pass by an angel visiting her the night before. How do you use your abilities to create positive changes in your life? I use my abilities everyday to help manifest and create the life I want. We are powerful beings indeed. 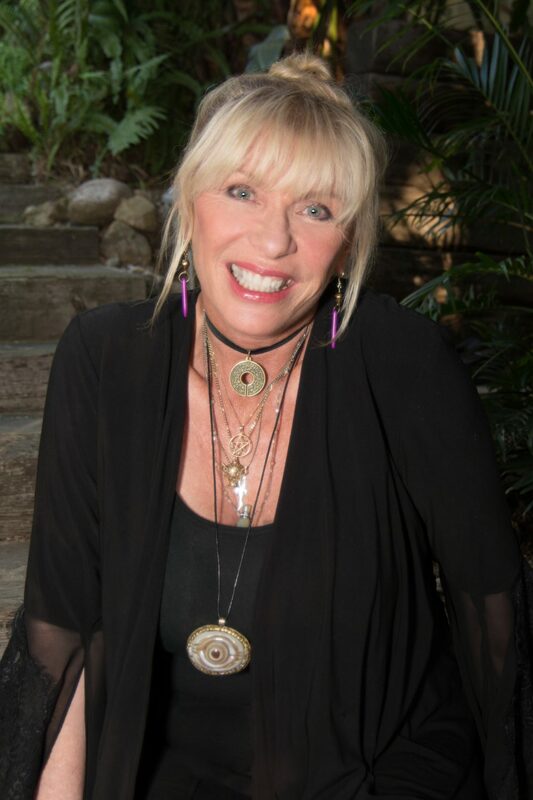 Honestly, my best magic is just intention and a perception change – and living into the “Mind, Body, Spirit” connection – which I believe gives you a “home run” most every time! My FAVORITE thing though is teaching other people how powerful and magical we are as humans… that sheer intent, belief and action can literally move mountains. Since you are always working, what do you do to keep a healthy lifestyle? Six days a week I go up to Lake Hollywood (a beautiful reservoir right under the Hollywood Sign) to work out. I teach a free class to anyone who wants to come. It’s called PACE Express. It was invented by a wonderful MD named Dr. Al Sears in Florida – and it has literally changed my life. I became a certified trainer in it. It is simple Interval training. The basic moves we all did in high school gym class – but in very specific, increasing short time spurts. In four 4- minute sets you can get the equivalent of an hour workout – and it’s the absolute best at heart and lung strengthening for health and stamina. We do it rain or shine – outdoors under the Hollywood sign amongst the deer, ducks and wildlife. I can’t even imagine starting a day without it anymore. After the workout, we walk about 2.5 miles round the lake and talk and take in the nature around us. I am then set for the day. Physically, mentally and spiritually!